The crowds on Wall Street after the stock exchange crashed. Seventy-nine years ago this week, the New York Stock Exchange experienced the worst financial panic the country had ever seen. There have been more crashes since  with bigger numbers and bigger losses  but nothing quite rivals the terror and devastation of Black Tuesday: October 29, 1929. Unsurprisingly, this exuberance lured more investors to the market, investing on margin with borrowed money. By 1929, 2 out of every 5 dollars a bank loaned were used to purchase stocks. The market peaked on September 3, 1929. Steel production was down, several banks had failed, and fewer homes were being built, but few paid attention  the Dow stood at 381.17, up 27% from the previous year. Over the next few weeks, however, prices began to move downward. And the lower they fell, the faster they picked up speed. 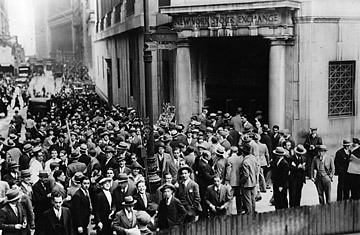 In the last hour of trading on Thursday, Oct. 23, 1929, stock prices suddenly plummeted. When the closing bell rang at 3 p.m. people were shaken. No one was sure what had just happened, but that evening provided enough time for fear and panic to set in. When the market opened again the next day, prices plunged with renewed violence. Stock transactions in those days were printed on ticker tape, which could only produce 285 words a minute. Thirteen million shares changed hands  the highest daily volume in the exchange's history at that point  and the tape didn't stop running until four hours after the market closed. The following day, President Herbert Hoover went on the radio to reassure the American people, saying "The fundamental business of the country...is on a sound and prosperous basis." And then came Black Monday. As soon as the opening bell rang on Oct. 28, prices began to drop. Huge blocks of shares changed hands, as previously impregnable companies like U.S. Steel and General Electric began to tumble. By the end of the day, the Dow had dropped 13%. So many shares changed hands that day that traders didn't have time to record them all. They worked into the night, sleeping in their offices or on the floor, trying to catch up to be ready for October 29. As the story goes, the opening bell was never heard on Black Tuesday because the shouts of "Sell! Sell! Sell!" drowned it out. In the first thirty minutes, 3 million shares changed hands and with them, another $2 million disappeared into thin air. Phone lines clogged. The volume of Western Union telegrams traveling across the country tripled. The ticker tape ran so far behind the actual transactions that some traders simply let it run out. Trades happened so quickly that although people knew they were losing money, they didn't know how much. Rumors of investors jumping out of buildings spread through Wall Street; although they weren't true, they drove the prices down further. Brokers called in margins; if stockholders couldn't pay up, their stocks were sold, wiping out many an investor's life savings in an instant. So many trades were made  each recorded on a slip of paper  that traders didn't know where to store them, and ended up stuffing them into trash cans. One trader fainted from exhaustion, was revived and put back to work. Others got into fistfights. The New York Stock Exchange's board of governors considered closing the market, but decided against it, lest the move increase the panic. When the market closed at 3 p.m., more than 16.4 million shares had changed hands, using 15,000 miles of ticker tape paper. The Dow had dropped another 12%. In total, $25 billion  some $319 billion in today's dollars  was lost in the 1929 crash. Stocks continued to fall over subsequent weeks, finally bottoming out on November 13, 1929. The market recovered for a few months and then slid again, gliding swiftly and steadily with the rest of the country into the Great Depression. Companies incurred huge layoffs, unemployment skyrocketed, wages plummeted and the economy went into a tailspin. While World War II helped pull the country out of a Depression by the early 1940s, the stock market wouldn't recover to its pre-crash numbers until 1954. See pictures of the top 10 scared traders.